A three-stage version of China's CSS-X4 intercontinental ballistic missile is being developed for various space applications. Bigger than either the USAF Titan II and the Soviet SS-9 Scarp, it stands about 141 ft (43 m) tall and has a maximum diameter of 11 ft (3.35 m). The rocket - to be known as "Long March 3"- has four gimbal-mounted engines in the first stage developing a com­bined thrust of some 280 tonnes. 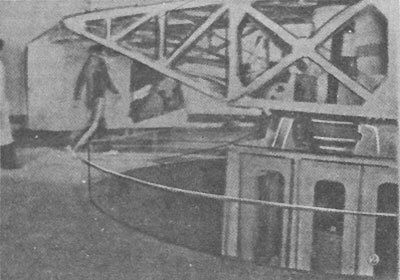 Stage two, supported by an open truss framework, has a single engine of the same type with a vacuum thrust exceeding 70 tonnes. Four small gimbal-mounted motors provide thrust-vector control. Both stages employ the storable propellants nitrogen tetroxide and UDMH. The third stage, which employs LO2/LH2 propellants, has four gimbal-mounted thrust chambers. The launcher will be able to send 800 to 900 kg payloads into geostationary orbit. China's first communications satellite is expected in 1981-82. 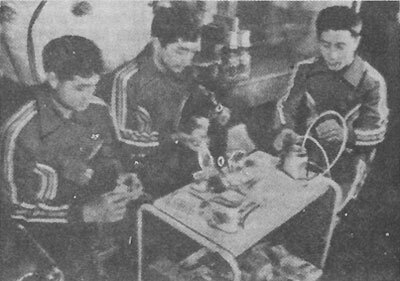 In the meantime pictures appearing in the Hangkong Zhishi monthly (April 1980) show preparations for manned space flight. They were supplied by our Belgian correspondent Theo Pirard. CHINESE ASTRONAUTS. 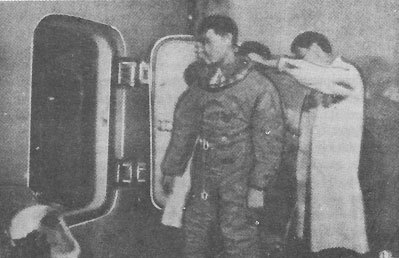 An astronaut-candidate - possibly one of three selected for an early mission - is fitted with a spacesuit before entering a space simulator. Astronaut-candidate ready for a test in the "environment chamber." 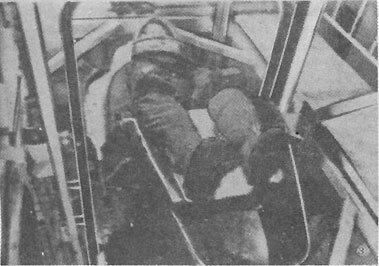 Like Soviet and US men of space, the Chinese astronauts undergo pre-flight training in a centrifuge. Candidates check out some Chinese food specially prepared for space flight. 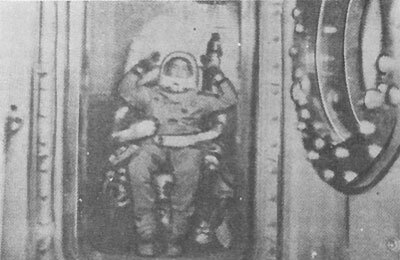 Clad in his spacesuit a Chinese astronaut prepares for a spin in the centrifuge. 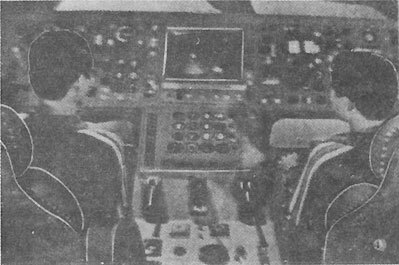 Two candidates undergo training in a space simulator.